Take a Look at Our Pryor Mustangs Facebook! By request of visitors to the Mustang Center, we have created a Facebook page: Pryor Mustangs. The page was developed by our two high school interns, Syd and Kassi, using Kassi’s beautiful photography. 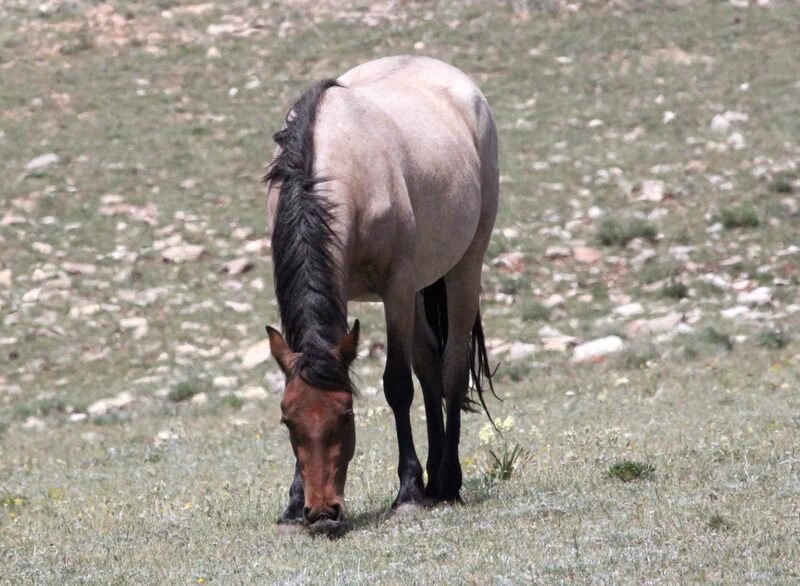 The whole purpose of this is to have an easy place for all of us to share photos, stories, and information about the Pryor Horses. 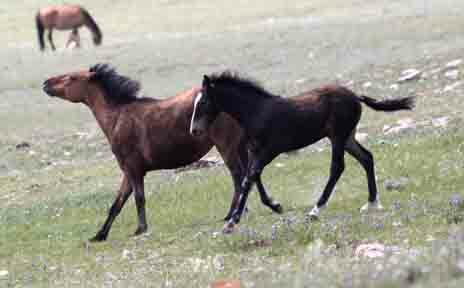 We will add updates about the wild horses and be available to answer any questions you might have. We will still use PryorWild to post longer articles on occasion. 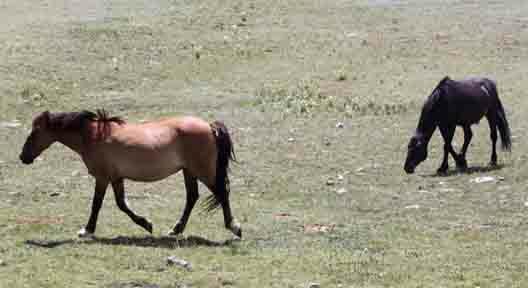 The network of advocates for the Pryor horses will provide a support system to help them continue to survive on into the future. 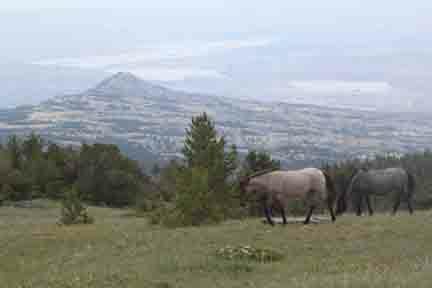 During the summer, the wild horses congregate on top of the mountain. 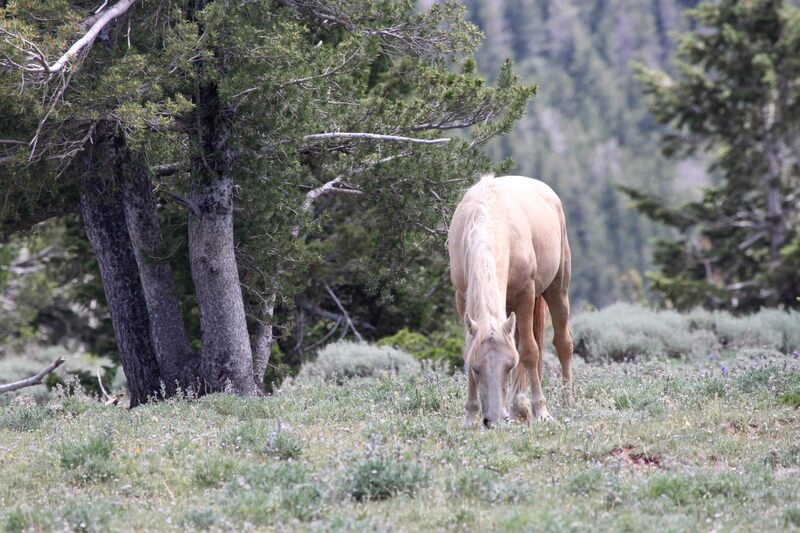 It’s a time of abundance for the horses…abundant food with the tender green grasses of the upper elevations and abundant water with the snow-fed pond near Penn’s Cabin. 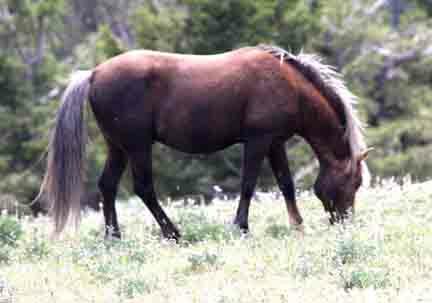 This adds up to abundant horses in close proximity to one another. 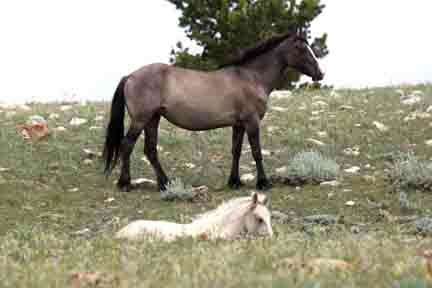 This abundance seems to change the wild horses’ tolerance for their proximity to one another. 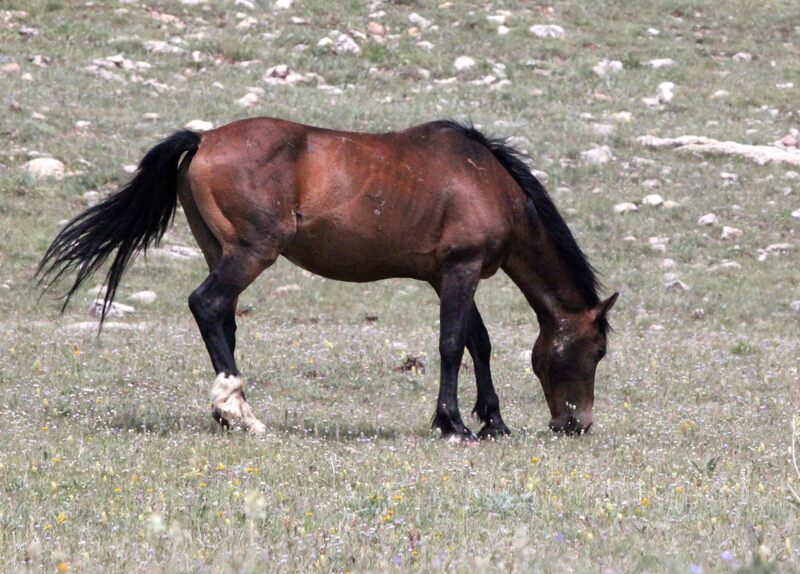 On a recent trip to the Pryors, 92 horses were spotted in one afternoon. 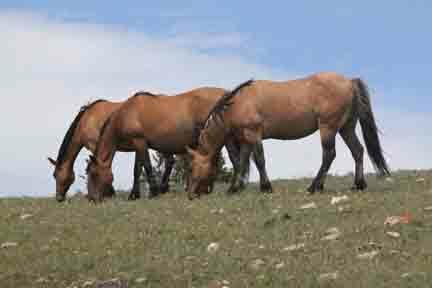 Most of these horses were gathered in the meadow just to the south of Penn’s Cabin. It was a small area with lots of horses. 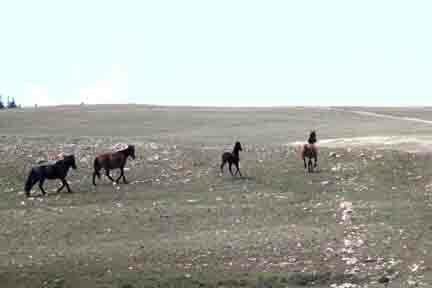 And while, for the most part, they tolerated the close proximity, the horses do remain vigilant and poised to take action if needed to keep their families intact. Cloud and Galaxy were apart from the main bulk of the herd, they were grazing quietly near the road to the Little Ice Cave. Feldspar keeps a close eye on her 2013 filly, Nimbus. Two bachelors grazed at the north end of the Cirque. The dark bay and black bachelors are always hard for me to identity. But my best guess is Hamlet and Hernando. 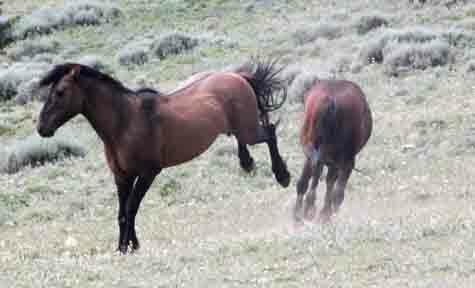 These two are pretty special as they are some of the few remaining forest service horses. 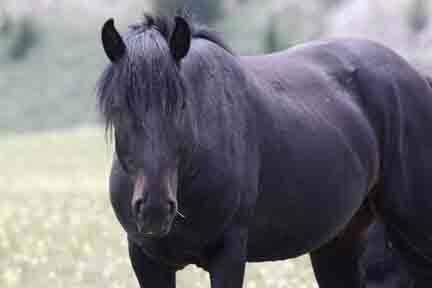 Hernando, is a 2007 dark bay stallion. 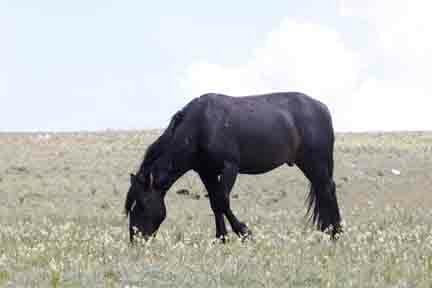 Hamlet, a 2007 black stallion. Underneath that shaggy forelock is a small star. From this point on, every horse spotted that day was on the Penn’s Cabin meadow. 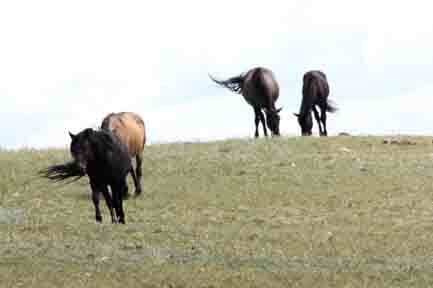 In a situation like this, it is beneficial to know the herd structure to really discern the dynamics of what appears to be a single, large herd of horses. Only then is it possible to see the behaviors of the individual bands as they maintain their family units within the tight proximity with each other. Morning Star’s band was spread out over the meadow. This was just temporary as he quickly lowered his head and snaked the family back together. 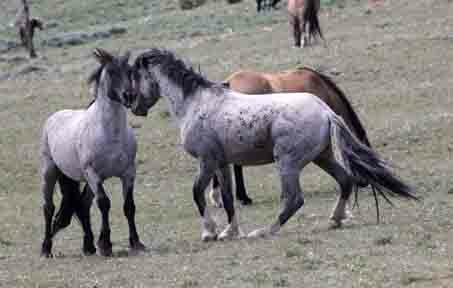 This behavior is a typical way for the stallions to keep the band members in a compact group. 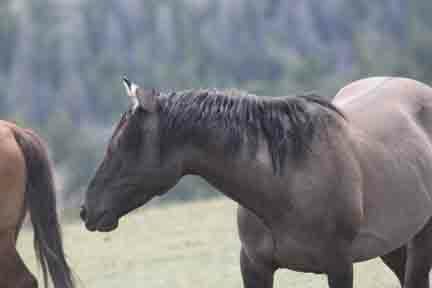 Morning Star, the dark bay stallion, snakes his mare, Felina back to the group. 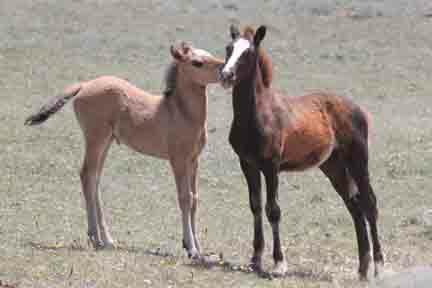 At this point in July, 14 foal births have been documented with 12 survivors. This birth number is low due to the use of PZP to help control the population. 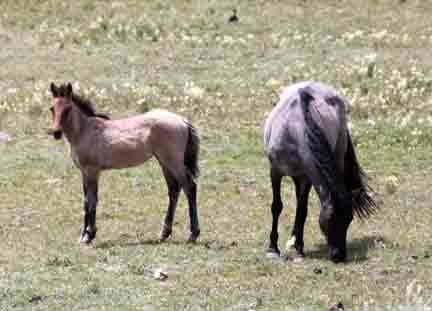 On a sunny day in July, the foals are charming to watch. They are playful, curious, and gaining some new-found independence. 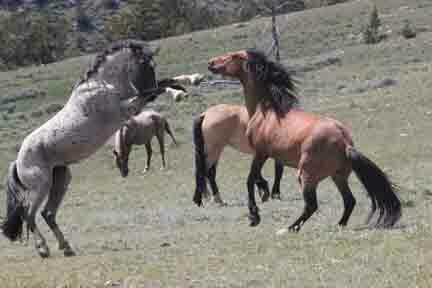 Perhaps the most dramatic wild horse behavior is the stallion action. And on this day in July, there was no shortage of this. 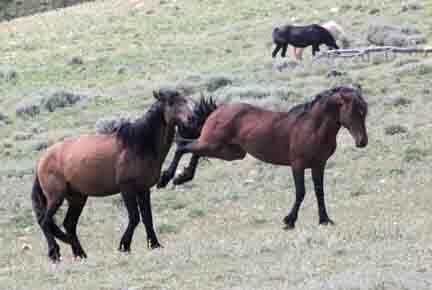 Although there were no serious, injury-causing stallion encounters, there were many small skirmishes. These were mainly due to the situation of the satellite bachelors. There were three satellite bachelors in the meadow that day. Tecumseh is dogging Gringo’s band. Fiesta has seemingly become a full time member of Horizon’s band, and Santa Fe sticks close to Coronado’s band. While today, Santa Fe was relatively quiet as he grazed near Coronado’s band, a few days ago it seems there was a different story. Santa Fe grazes near Coronado’s band. Sandy Elmore relayed to me the story of La Brava’s foal that got separated from her mother on the day of her birth. Unfortunately this young one didn’t survive. It’s highly possible (although speculation), that this situation was a result of the pressure Santa Fe put on Coronado. La Brava recently lost her foal through separation and ultimately death of the foal. 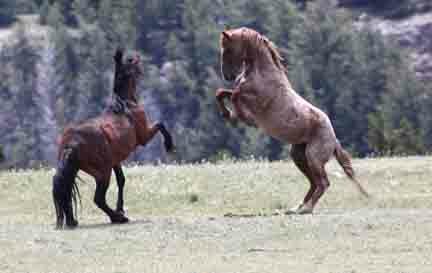 Today Fiesta and Tecumseh were the instigators of the stallion action. The close proximity of the horses increased the vigilance of the stallions as the two bachelors wandered too near. The band stallions would have brief challenges, as well. Jackson and Gringo used their back legs to make a statement! First Jackson fires at Gringo with both back legs. Then Gringo returns the move back to Jackson. Seeing Garay today took me back to another summer day with stallion action in nearly the same location. Garay and Grijala were putting extreme pressure on Lakota. 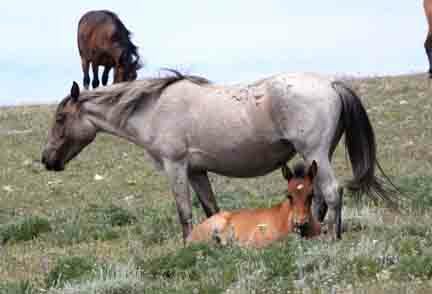 Today Garay has Quelle Colour and her 2013 filly, Kohl with him. The missing tip of his left ear is the result of the battles with Lakota and Grijala. Another defense mechanism the horses use is movement around the perimeter. This was seen by both Doc’s band and Corona’s band. Doc, Broken Bow, Demure, and Malpais came up from the direction of Sykes Ridge and moved quickly around the south perimeter of the herd. Corona is not typically seen on the top of the mountain. In the past, he was spotted on Mustang Flats or on lower Sykes. However, he and his band were up on top. Perhaps, Topper has something to do with this. She is a recent addition to his band, and she is also very familiar with the higher elevations. With Topper in the lead and Corona at the back, the band moved around the north perimeter at a quick pace. Once they got a little space between them and the herd, Norte decided it was playtime with Topper! It wasn’t all action on the mountain. For the most part, it was quiet grazing and resting as the horses enjoyed the abundant food on a glorious July day!